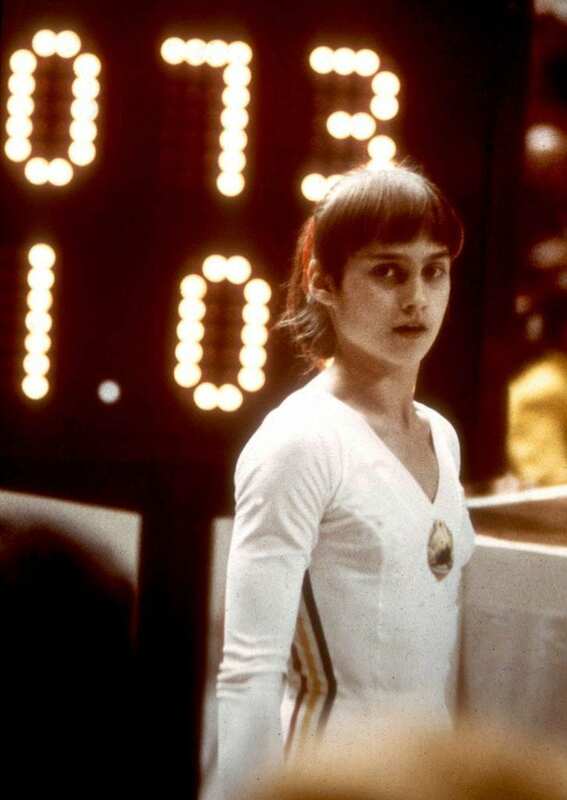 At 14, Nadia Comaneci wowed the world with her record-setting gymnastic performances at the 1976 Olympics in Montreal. Shortly after reaching the pinnacle of success and becoming a global icon, her life began to crumble. Miraculously, she was able to extricate herself from multiple life-threatening situations and reinvent herself time and time again. Here’s the crazy story of how the world’s greatest gymnast found herself atop life’s podium. Flacara, meaning “Flames” in Romanian, was Nadia Comaneci’s first gymnastics team, a name fitting for a girl who would one day wow the world and take the Olympics by storm. A name very fitting for a girl from the mountains of Romania whose image would be burned into the minds of the stunned television audience as she made Olympic history at the young age of 14. However, it was Nadia’s epic tale of survival that really punctuated her incredible life story and defines the true meaning of success. That’s because Nadia’s journey took her from child star and national icon to political prisoner in a brutal communist regime. It then took her to the heartland of America where she’d finally find happiness, something that eluded her despite her success. It’s all of those unlikely elements that make her journey so much more improbable, important, and valuable than any of the nine Olympic medals she no longer has. 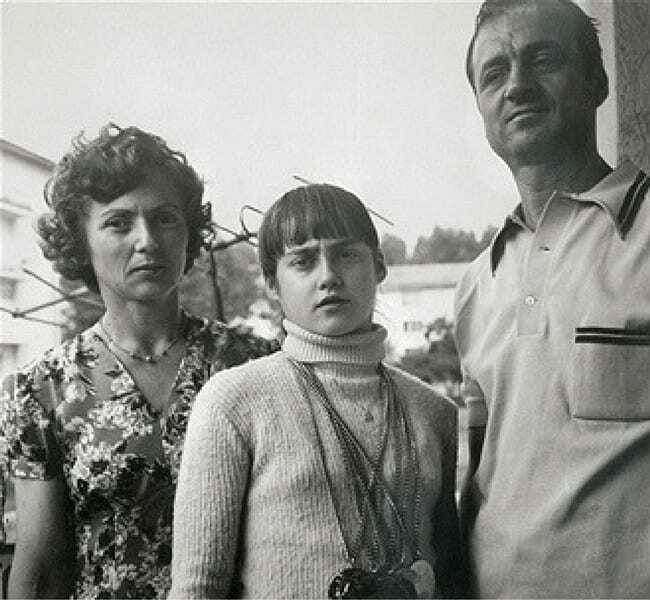 Nadia Comaneci, the daughter of a mechanic, grew up poor in the small town of Onesti. Like most children, she was a ball of energy that couldn’t be controlled, and at recess, Nadia and her friends would execute perfect cartwheels and other gymnastic moves on the playground. Normally, these ordinary moves would go unnoticed. But Bela Karolyi, the legendary gymnastics coach, the man behind the resurgence of U.S. women’s gymnastics, happened to be in the area. By chance, Karolyi decided to open up a gymnastics school in Onesti and would spend his afternoons at the local schools, scouting recesses for latent talent in a country full of promising gymnasts. 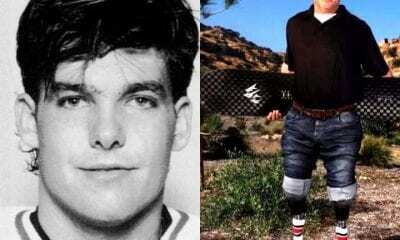 On one such afternoon, he popped into a recess where his eye was immediately drawn to a girl doing perfect cartwheels and other athletic moves. Karolyi was hooked, but before he could approach the pupil, the bell rang and the students were shuffled back into their classrooms. He panicked, unsure of how to proceed, knowing very well that this girl had a genuine talent, and losing this opportunity to coach her would be catastrophic. So Bela went inside and walked into every class and asked the students who loved gymnastics. The girl and a friend answered. He found her. “It was an important moment in my life,” Karolyi reflected to Sports Illustrated. That girl turned out to be Nadia. As a six-year-old prodigy training in a communist country with an emphasis on discipline and success, life for Nadia wasn’t easy or glamorous. It was spent in the gym, practicing six to seven hours per day with nearly-robotic precision. But for Nadia, the gym was her sanctuary, the place that helped her escape Romania and its crumbling economy, its bleak, oppressive communist way of life. 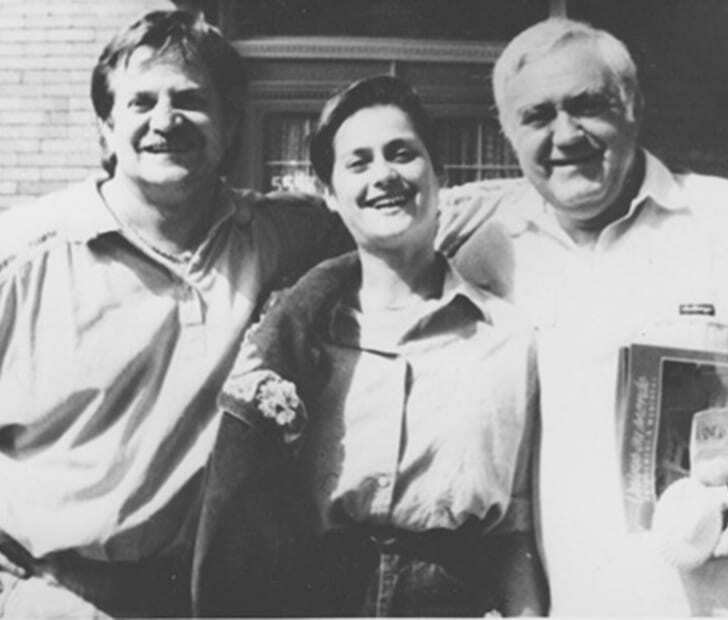 Outside of Karolyi’s gym, Nadia was like everyone else, a number in the system, but inside, she was a star. Slowly but surely, Nadia’s practice and patience began to pay off. “I actually did a lot more than they were asking me to do and I think about when Bela used to say ‘today we do five routines on the beam’ and I used to do seven. So I could do more than he was asking. I don’t mind working hard and don’t complain if I work hard” (Euronews). Then, in 1976, Nadia got her first big break on the world stage. At the inaugural American Cup, a premier gymnastics competition that featured top talent from around the world, Nadia Comaneci dominated. Her training paid off and she was awarded with the gold medal in the women’s division. That competition, more importantly, was a springboard for her quest towards Olympic history. It was also at that American Cup where Nadia would share a brief kiss. That kiss, seemingly innocent at the time, would end up having a profound, lasting impact on her life decades after it occurred. 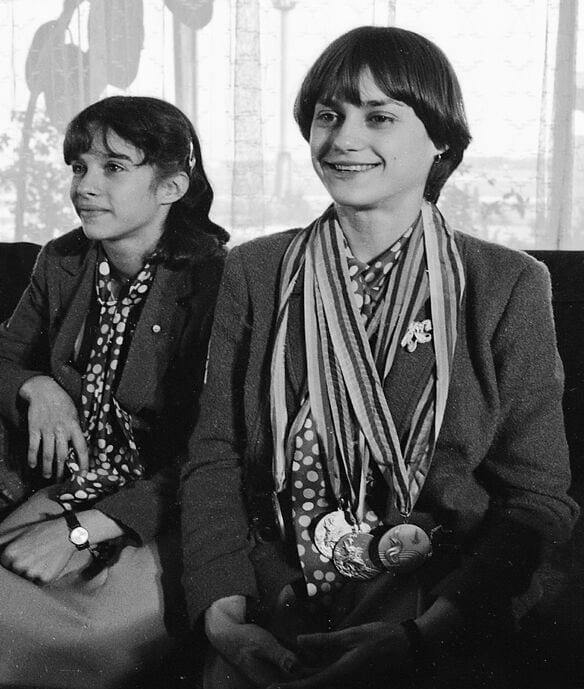 Four months after dominating the American Cup in front of a sold-out Madison Square Garden, a 14-year-old Comaneci was set to head to Montreal for the 1976 Olympics as a member of the Romanian Olympic delegation, a daunting task for a 4-foot-11, 85-pound girl. Despite her diminutive stature and larger-than-life expectations in front of millions of peering eyes, Nadia didn’t falter, bend, or break. Well, she kind of bent, but those contortions were by design and were a part of her once-in-a-lifetime routine. As Comaneci stepped up to the floor, the usually-rowdy Montreal crowd was hushed to a complete silence. They were captivated and star-struck as they witnessed history. Each swing, jump, and twist was executed to perfection. Each landing accompanied by a smile. Nadia was zoned in. Not even the gasps of the stunned audience could throw off this tiny teenager who seemingly defied physics and gymnastic precedent. When her exhilarating routine concluded, Comaneci calmly awaited her score, completely unaware of the history she was about to make. “I was told, ‘a 10.00 is not possible,’” recalled Daniel Baumat, the director of Swiss Timing. So we only did three digits” (The Guardian). And for Nadia, a girl who entered the Olympics with self-described “low expectations,” the score came as a complete surprise. “I always say about the fact that I don’t watch the scoreboard because I feel how I did the routine. I thought I did a pretty good routine” (Euronews). When she finally did turn around to look at the scoreboard, she saw 1.00. The equivalent of an F-, a score so bad it’s almost as unheard of as a perfect score. But it was an error. The scoreboard wasn’t programmed to take into consideration a perfect 10. It hadn’t been done before, and there was no reason to believe it was about to be done, especially by a 14-year-old girl. Yet, Nadia did it on the uneven bars. A perfect 10. Olympic history had been set, and she was just getting started. In total, Comaneci earned seven perfect 10s, a feat so remarkable that it virtually solidified her as the greatest Olympic gymnast in history. Today, the minimum age to compete in the Olympics is 16, making her record as the youngest gymnastics champion unbreakable. When the 1976 Olympics wrapped up, Nadia managed to rack up three gold medals, one silver, and one bronze. She also became a celebrity and national icon overnight, something that would indirectly alter her life in innumerable ways. 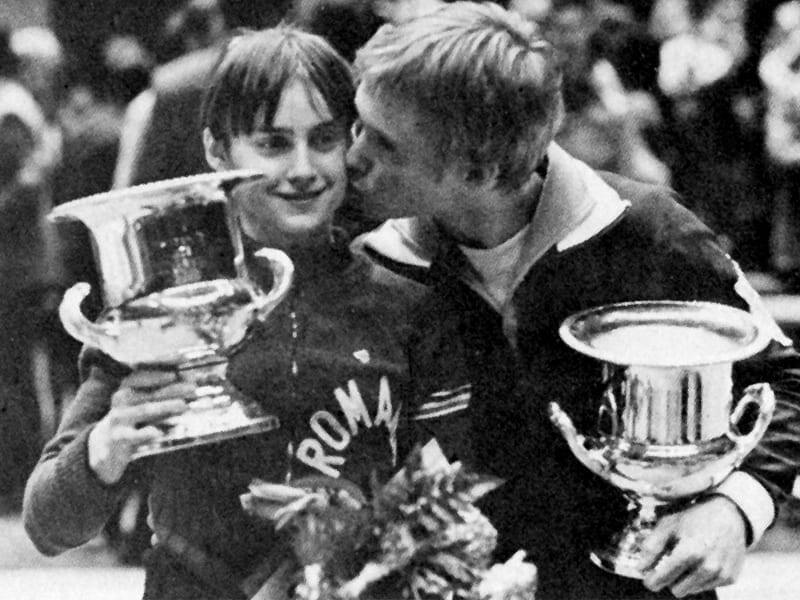 As if her trophy case wasn’t already replete with medals and trophies, Comaneci was awarded the AP Female Athlete of the Year in 1976 and the BBC Overseas Sports Personality of the Year. Back in Romania, Nadia was awarded the title of “Hero of Socialist Labor” and received the golden “Hammer and Sickle” medal. Romanian president and Communist Party Chief Nicolae Ceausescu personally bestowed the honors upon the new star. Her face was printed on stamps. Her legend put Romania on the map. The song she danced to, “Nadia’s Theme,” went gold. She was a tiny model of perfection and success in an era and region defined by a lack of individuality. Yet as quickly as she rose to the top of the podium, Nadia plummeted from it just as fast, and her life began to spiral out of control. 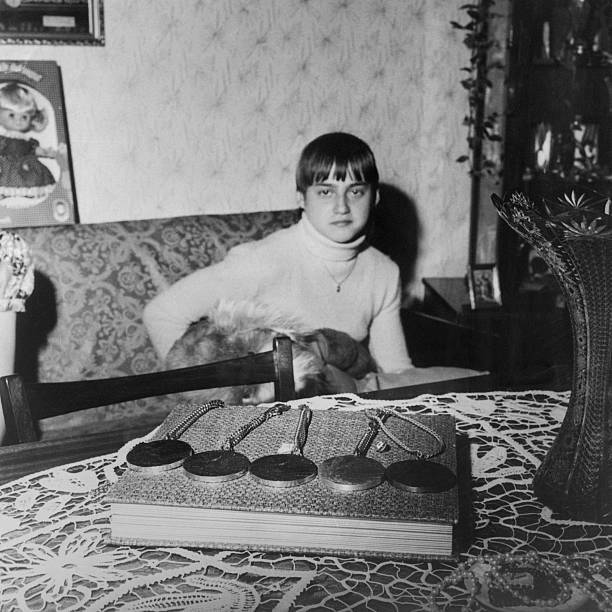 One year after her Olympic triumph, Nadia was in a hospital. “I was glad because I didn’t have to go to the gym,” she told Life Magazine. The news broke and was heard around the world. Nadia Comaneci, the sweet face of the Montreal Olympics, attempted to kill herself by drinking bleach. The stardom and pressure were too much for her to bear. As a result, she gained an unhealthy amount of weight, which prohibited her from competing. When she did compete, her form was off and she was a shell of her former self. Then the Romanian government inexplicably separated her from her coaches and her performance faltered even more. She fell into a deep depression, one that she was barely able to crawl out of. Reunited with her coaches, her comeback was rapid and impressive, and four years after her initial triumph in Montreal, Nadia was back on the Olympic stage. With the Olympics being held in Moscow, the crown jewel of the Soviet Union, this was Romania’s chance to prove its superiority over the USSR, a regime that heavily influenced Romania post-WWII. In Moscow, Nadia excelled once again, winning two gold and two silver medals. But her performances were mired by controversies regarding her scores. Her coaches believed the judges unfairly docked her points while awarding bogus points to the home-team Soviet gymnasts. Karolyi claimed the judges had “an arrangement to give low scores to Nadia” (Sports Illustrated). The entire debacle, especially Karolyi’s argument with the judges, was captured on camera and drove a wedge between the already strained relationship the Romanian government had with the fiery coach. Following another legendary Olympic performance, Romania decided it was time to capitalize on their national treasure. 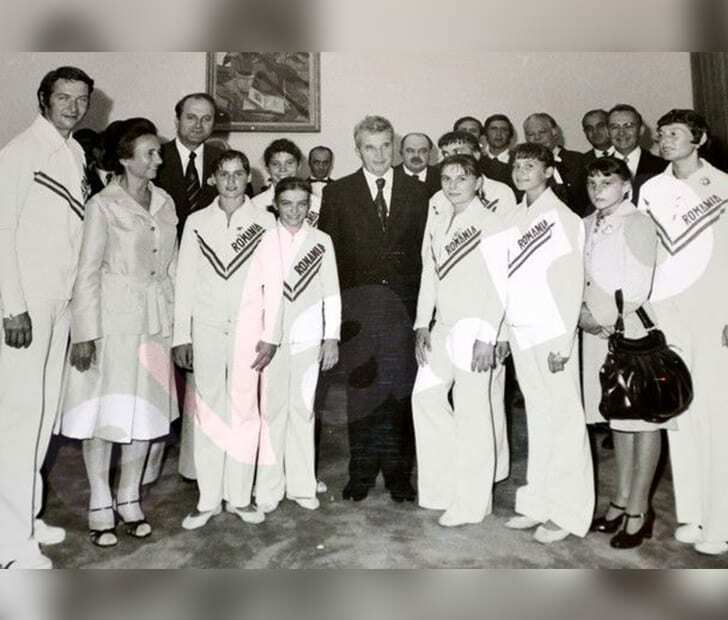 So in 1981, the country organized an 11-city “Nadia Tour” where the gymnast, along with her American contemporaries, would tour the United States, raising money for Romania. Her coach, Bela Karolyi, would lead the tour that ended up generating $250,000 for the State. However, Nadia only saw a sliver of that and pocketed a mere $1,000. Then, on the last day of the tour, Nadia’s coaches made the most surprising move of their careers. They defected to America. The Romanian plane waited for three hours at the airport but the defectors were not coming back. The tension between the State and Bela Karolyi could be cut with a knife. As the U.S. trip concluded, the Karolyis, along with other staff members, decided they needed to make a change. The Romanian government was hampering their abilities to coach and using the athletes as pawns to propel Romania into the international spotlight. 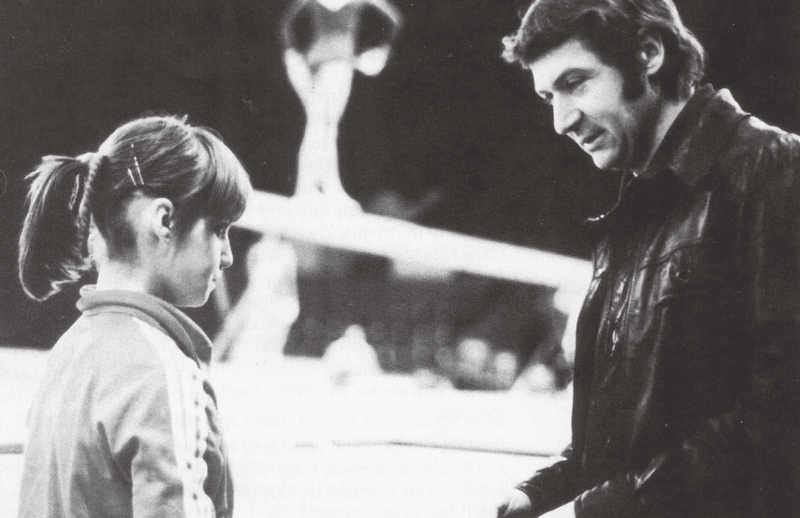 “This interference with Nadia’s career led to her widely publicized decline between 1977 and 1978,” Karolyi told the Washington Post. And once Nadia became a national icon, a cash cow to be milked at Romania’s convenience, she was snatched from the tutelage of the Karolyis. But “when Nadia slipped, the state rushed back to us, asking us to take her back. This exercise took place on three separate occasions, and it made us very unhappy” (Washington Post). While the Karolyis began their new life in America, Nadia’s life began to take an unfathomable turn for the worst. “My life drastically changed after the Karolyi defection,” Nadia said. “I was no longer allowed to travel outside Romania. Whenever the Gymnastics Federation put me on a list to travel for some kind of exhibition tour, the list came back with my name crossed out. I was cut off from making the small amount of money that had really made the difference in my family’s life. I started to feel like a prisoner. In reality, I’d always been one” (The Guardian). And the preferential treatment most national heroes get was just a figment of her imagination. “I had to live like everybody else…(and) stand in lines, and miss out, and be followed by the police. I had no money, no special treatment” (The Guardian). Just like her former coach, Nadia needed to make a decision, lest she waste away her career and life in a communist country ruled by a murderous drunk. 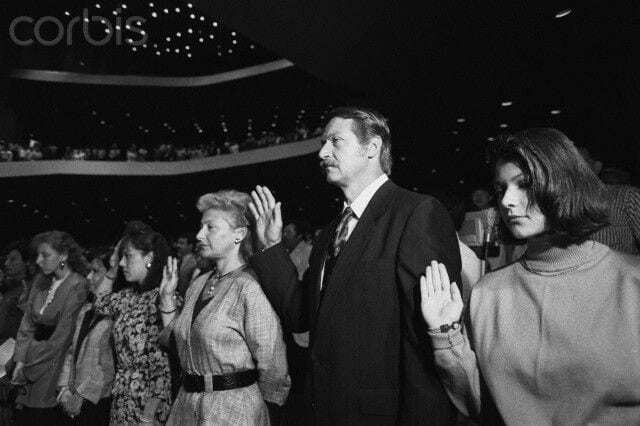 In 1989, Nadia, aided by a man named Constantin Panait, trudged for six hours through the cold night, over frozen rivers, past armed guards and barbed wire fence, to the Hungarian border. “We were stumbling and often crawling through water and ice,” Nadia remembered (LA Times). “Leaving meant you were gone. You couldn’t go back. I didn’t tell my mom” (Daily Mail). “I could not bring anything else with me (other than the clothes on her back), not even my precious gold medals or a photograph or my family” (LA Times). After making it to Hungary, Nadia proceeded on to Austria where she finally found the U.S. embassy. There, the embassy provided her with a flight to New York and a path towards salvation. Little did she know that America would become more like the land of in-opportunity. When Nadia arrived in the States it was with much fanfare and enthusiasm, two emotions that would soon disappear. In the public’s eye, she was still the 14-year-old darling that charmed the masses with perfect 10s at the Olympics. However, shortly after her arrival, controversial and contradictory details leaked out about her supposed relationship with Nicu Ceausescu, the son of the brutal dictator Nicolae. Back in Romania, Nadia’s mother maintained that Nicu raped Nadia when she was still a 17-year-old virgin. Others claimed they had a legitimate relationship marked by debauchery and lavish spending. Nadia, conversely, had this to say regarding her relationship with Nicu. “So when people see Nicu and me, they think we are lovers only because they know me. All lies” (LA Times). But her reputation was further smeared when details emerged regarding the man who set her free, Constantin Panait. Panait was a Romanian roofer who moved to Miami with his wife and child years before Nadia escaped. Some say he was a family friend of the Comanecis, while others say the two met at a party. Regardless of how the two ended up meeting, their relationship appeared scandalous from the outset. When Comaneci was asked if she knew Panait was married, she replied, “Yes, so what?” This reply didn’t sit well with the American people. When Panait was asked how his wife was doing with the bizarre situation, he replied, “She has been hurt, but (this romance) was the right thing to do” (LA Times). The public was further enraged when Panait’s estranged wife was interviewed and said, “I am sorry my husband ever helped Nadia escape because it is giving me a lot of trouble” (LA Times). And Nadia, unfazed by the negative publicity surrounding her scandalous affair, publicly decried Bela Karolyi. “I have no business with my former coach,” she told the LA Times. Despite the animosity, Karolyi wished his former pupil well but expressed concern with Panait. “I don’t know who he is, what he wants or what his plans are. I appreciate his courage, taking a risk to get her out of Romania. But I want to know if he truly wants to help her,” he told the LA Times. Failing to contact Nadia, it turned out, wasn’t an isolated event and concerned more people than just her former coaches. “She doesn’t remember it of course. But I do. Who could forget someone who went on to score a 10 and change the sport forever?”- Bart Conner, U.S. Olympic gymnast and two-time gold medal winner reflecting on an iconic photograph. 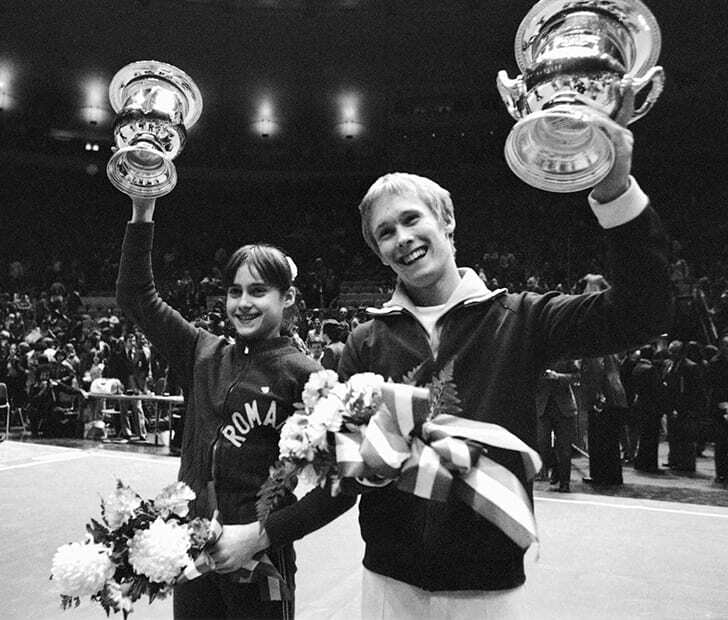 That photograph he’s recalling took place at the 1976 American Cup after Conner and Nadia both won their respective divisions. As Conner stood next to Nadia on the podium, a photographer suggested that he give her a kiss on the cheek, and he obliged. That kiss lingered in Conner’s mind, and he, like the rest of the world, closely followed Nadia’s gymnastic career. When Nadia came to America on her 1981 tour, Conner reunited with her, and a friendship slowly blossomed. But maintaining a connection with her proved difficult. When Connor, and other U.S. gymnasts, found out that she defected to the States in 1989, he tried reaching out, wanting to offer a helping hand. Nothing. No replies, no contact, and no information regarding her whereabouts. 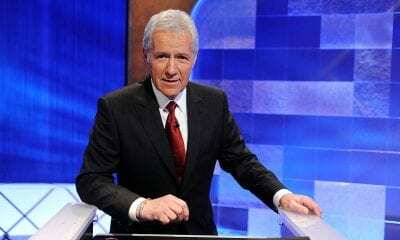 Then Conner caught wind that Nadia was set to appear on the Pat Sajak Show. He learned of this hours before the show was scheduled to air on CBS. Frantically, he called an old friend who happened to know one of the show’s producers and asked for a favor. Midway through the show, the host announced that there would be a special guest in attendance, and from behind the curtains emerged Bart Conner. He had barely caught a flight from Oklahoma City to L.A. and was escorted to a CBS-arranged helicopter that flew him directly to the studio. Conner arrived just 10 minutes before the show started. He emerged on-stage clutching a bouquet of roses and flashed his signature smile. 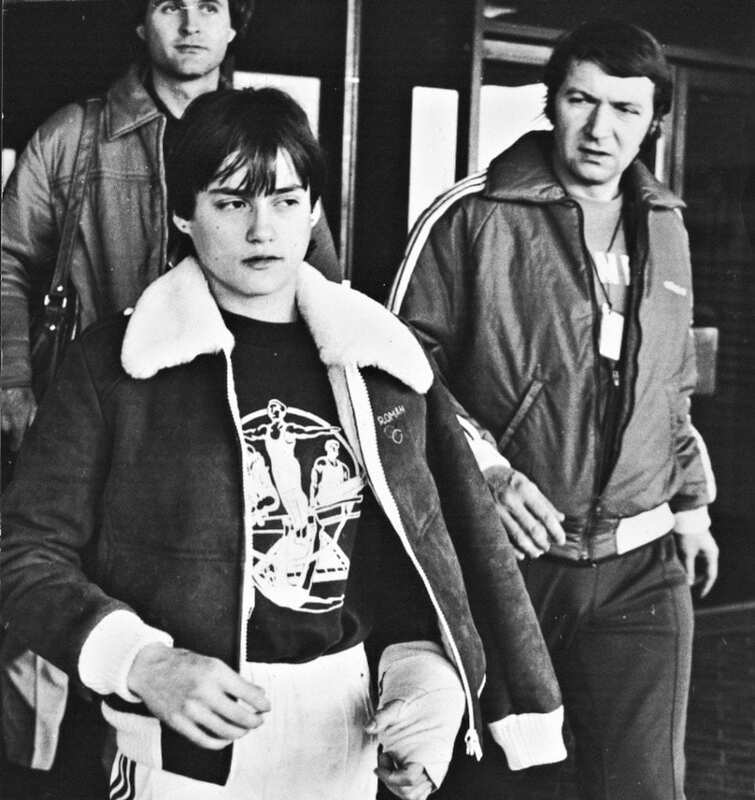 Comaneci and the tight-lipped Panait seemed visibly stunned by his appearance. As the segment wrapped up, Bart mentioned how he heard her transition to the States had been anything but smooth. “But I wanted to stop by to welcome you because I know that you’re introduction here to America has been less than great and it has been difficult for you and to leave your homeland and come here, and on behalf of the athletes we want to welcome you and tell you we love you and appreciate all you’ve done for our sport,” Connor said. Little did he know just how difficult her life in America had been. On the outside, everything may have appeared to be going well for Nadia in her new country. She had done some commercial photo shoots and had a movie about her life in the works. However, this was a facade, and behind it her life was actually crumbling. Once her savior, Panait had turned into her captor. “When I came to the United States this guy kept me like I was in a prison. He didn’t let me call anybody. I couldn’t call my family in Romania. I knew something was wrong” (UPI). Isolated from the outside world, Nadia’s world was once again turned upside down. Panait exercised total control over her life and threatened to deport her back to Romania should she disclose any of the abuses. He stole the money she earned from interviews and television appearances, and worst of all, he physically, mentally, and potentially sexually abused her. “I was in a free country. But I was not free…He used me for money” (UPI). Panait shunned her from the outside world, keeping her isolated and bereft of communication. It was Panait that prevented her from speaking with the athletes and her old coaches. “What I felt, I can’t explain. I started to cry. All along, I wanted to see him (Bela Karolyi), but I wasn’t allowed to by Panait. It was all a misunderstanding,” she told the Chicago Tribune. Finally, there was a light at the end of the tunnel: Alexandru Stefu. Alexandru Stefu was a Romanian ex-pat living in Montreal. He was heavily involved in the sports community there and was the former rugby coach of the Romanian National Team. 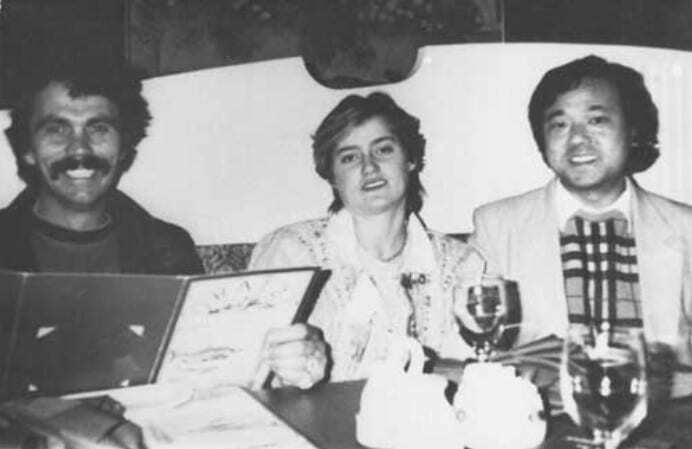 He was also friends with Bela Karolyi. Karolyi, who had long sensed trouble with Nadia, requested that Stefu reach out to Panait. It was a simple ploy. Offer Panait, the greedy, money-hungry captor, a lucrative deal for him and Nadia in Montreal. Eager to continue profiting off her celebrity, Panait accepted the offer and took Nadia to Montreal to meet Stefu. There, Stefu immediately sensed something was horribly awry. It wasn’t verbally communicated because Nadia was never let out of sight, but her body language said enough. The next morning, Panait fled Montreal with $150,000 of Nadia’s hard earned cash. “He punched her, black and blue,” Stefu said. “The guy is a bandit” (UPI). With her captor out of the question, Nadia was finally free and set up, with Stefu’s guidance, a new life in Montreal. But the exhilaration of freedom was, yet again, short-lived. Nadia moved in with Stefu and his family in their Montreal apartment. She kept in touch with Bart and performed with him on gymnastic all-star teams. “He’s my best friend,” she told People Magazine in November of 1990. Then her phone rang. It was the police relaying tragic news she never thought she’d hear. Alexandru Stefu had tragically died in a scuba diving accident at 47. She was heartbroken and in a panic. Once again, the fragile stability that was her new life was teetering on the edge of collapse. Out of options, she turned to the man who startled her on national television years ago, Bart Conner. “I’d never heard someone so terrified in my life,” Conner said. “Stefu was the one good thing that had happened to her in her life and he was gone” (Chicago Tribune). Naturally, Conner offered Nadia a place to stay in Oklahoma. He was in the process of setting up a gym and could use an extra hand. After a year of living together, romance between the two finally blossomed. “We were good friends before there was physical attraction,” Conner recalled to the New York Times. “I was curious about him. He didn’t want anything in exchange for helping me,” Comaneci told the New York Times. In 1994, years after dating, touring together, and building a life together, Conner, on Nadia’s birthday, proposed. Although it was the surprise of a lifetime, Nadia had an inkling that he was about to propose. “He got me a ring, then a bracelet– he was running out of jewelry. The engagement ring had to be next,” Nadia fondly remembered (NY Times). Two years after their engagement, the two former Olympic gold medalists married in Bucharest, Romania. “Romania had a big role in everything that I’ve done, and still has. I couldn’t imagine doing the wedding somewhere else,” she told the Huffington Post. Back in her home country, the wedding became of national interest and was broadcasted live on television. The entire country had the day off from work as Romania’s golden child became a goddess enshrined in the country’s lore forever. “Most women bring the man home to meet the father,” Conner said. “I had to meet the entire country” (Chicago Tribune). And the usually stoic, emotionless Nadia revealed a side of her not many had seen before after her marriage. “Bart is something everyone wants in a person. He helps everyone. You look at his face and what you see is that you can trust” (Chicago Tribune). 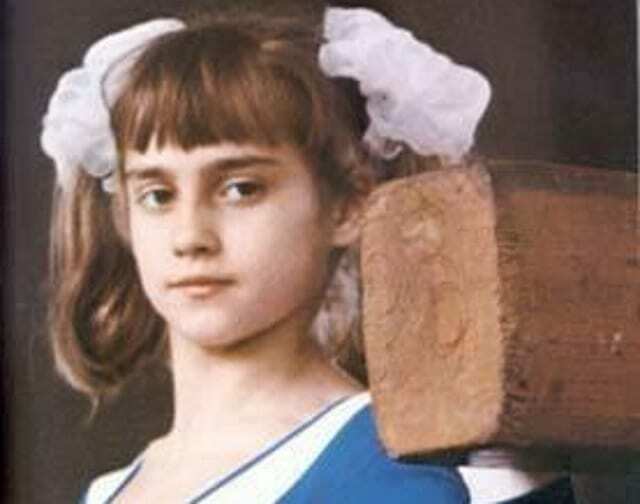 In 2001, Nadia received another remarkable honor, one completely unrelated to her gymnastics career. “I never thought I would be standing here, married to an All-American guy, living in Oklahoma,” Nadia told the courtroom. “What a country” (Arizona Daily Sun). Those were her first words after becoming an American citizen. Since becoming a citizen, Nadia has had a child named Dylan and works with her husband at a gymnastics academy they co-own. Comaneci is also a member of the Oklahoma Sports Hall of Fame. She wasn’t the first foreigner in the hall, but she was the first athlete whose athletic success came as a representative of a different country. Today, however, her biggest joy — other than her son — is helping with a few charities she holds close to her heart, namely the Special Olympics and the Muscular Dystrophy Association. Nadia was also honored at Monticello’s (Thomas Jefferson’s estate and current museum) 50th Annual Independence Day Celebration and Naturalization Ceremony. By speaking at the event, Nadia became the first athlete to deliver the keynote speech. Decades after becoming the first gymnast to score a perfect 10, Nadia is still managing to find new firsts and push the envelope of success. Back in Canada, the place Nadia rose to fame and lived, the former Olympian is still being honored and celebrated. The Windsor Essex Sports Persons of the Year committee nominated Comaneci as the event’s keynote speaker. “I am honored and just happy to be there and be a part of these awards,” Comaneci told CBC, the largest Canadian broadcasting and news corporation. And the locals are hopeful that Comaneci’s presence will boost gymnastics participation in an area dominated by ice hockey. Despite Nadia not electing to live in Canada, the country still resonates with her after having such an enduring impact on her life at such a young age. Out of all the people in the world for Nadia to befriend, choosing an actress who was most famously known for her marriage to Tom Cruise seems rather unlikely. And out of all the film possibilities for a director to choose from, electing to document Nadia Comaneci’s life seems just as unlikely. Many people have made Comaneci the subject of documentaries and short films, and the subject seems a bit played out. But Katie Holmes was determined to tell Nadia’s tale. And throughout it all, an unlikely friendship developed between the two stars. The film, Eternal Princess, was only 17 minutes long and told, from a slightly different angle, Nadia’s incredible journey. Although Nadia, a full-time mother, is no longer a competitive athlete, that doesn’t mean she forgot how to stay in shape. Nadia told InStyle Magazine that her “idea of a good workout is something that fits easily into my lifestyle…I like to workout every day. I prefer to workout in the morning and I do a maximum of 30 minutes, which will include cardio like running or the elliptical and stretching and light weights.” Her favorite clothes to workout in? “Loose shorts and a comfy tee.” Although shorts, t-shirts, and some light cardio is a far cry from her regimen as an Olympian, it appears to get the job done for Nadia. Just because Nadia is no longer competing, that hasn’t stopped her from getting perfect 10s. Like most people who have adapted with the times, Nadia has found a way to get involved in technology, and more specifically phone applications. Nadia released Nadia’s Perfect 10-Gymnastics for Android phones that lets users play as Nadia while attempting to get a perfect score. And by releasing this game, Nadia became the first gymnast in history to release her own game. Safe to say playing the game on your phone is easier than hitting the gym and practicing some of those electrifying moves that made her so famous. According to the gymnastics academy’s website, “The Bart Conner Gymnastics Academy in Norman, Okla. is one of the largest and best-equipped gymnastics centers in the United States.” The gym features state-of-the-art equipment and despite the gym’s namesake belonging to Bart Conner, Nadia’s presence is equally felt there. 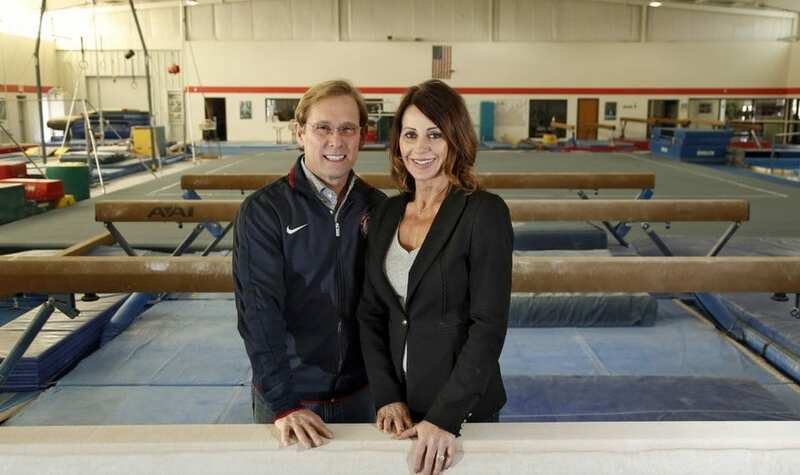 Oklahoma may not seem like a gymnastics epicenter, but with two famous Olympians running one of the bigger gymnastics gyms in America, it just might become one. For Conner and Nadia, it’s only a matter of time until their only son gets involved with sport, and when he does, he’ll have the perfect place to train. “When I look back at everything that has happened in my life. I don’t think that there would be one thing that I would have done differently because every little thing that I have done connected the dots to what I am today” (Euronews). Back in 1976, Nadia set the bar, and the new standard for gymnastics was born. She defined the sport and was an impetus for change and growth in a sport that has since exploded in popularity. Since retiring from the sport, her life has taken her through extreme highs and devastating lows. She’s reached the pinnacle of success and plunged to the deep depths of failure, but all of it has shaped who she is and has helped her tell an improbable story that has left an indelible impact on the world.